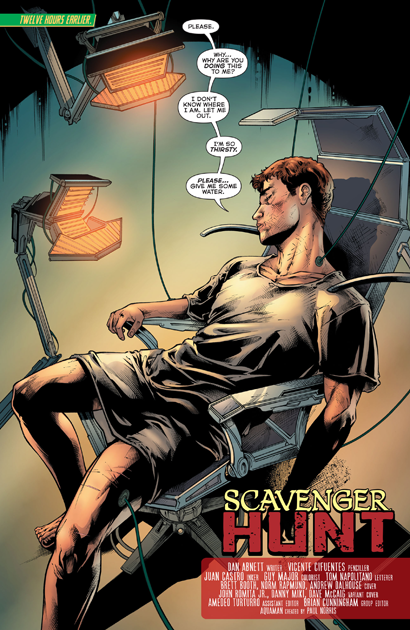 "Scavenger Hunt" by Dan Abnett, Vicente Cifuentes, Juan Castro, and more. The man, John Payne, has killed twelve people so far, but he has no memory of any of it. It seems as Dead Water he has been exacting revenge on all those people in his life who have crossed his path in a negative way, including ex-wife. The last thing he dos remember is working salvage for a man named Peter Mortimer. 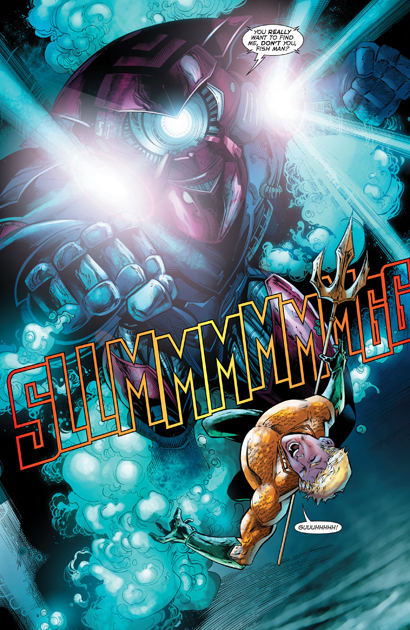 Aquaman knows that name, for it is the alter ego of the arch criminal named...The Scavenger! I thought this issue was a slight step back from the last two, mostly because it didn't feel like a story, just a series of random scenes. There's some good stuff in those scenes, the book just didn't hold together for me as much. 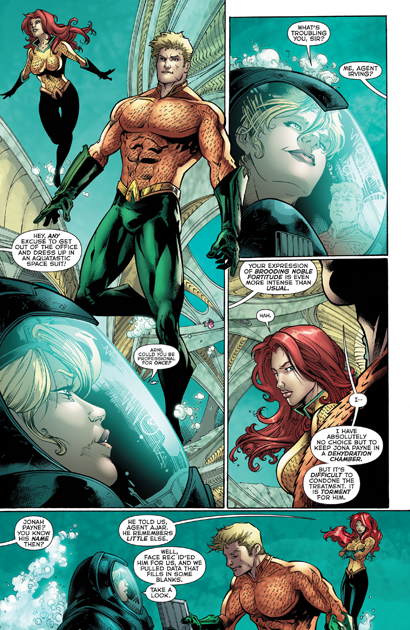 Also, I know this is a superhero comic and all, but I wish the artists would tone it down a bit when it comes to Mera's anatomy, it feels like every month her waist gets smaller and her chest gets larger. I hope when regular artist Brad Walker takes over we can get away from the "lad mag" look into something a little less cartoony. 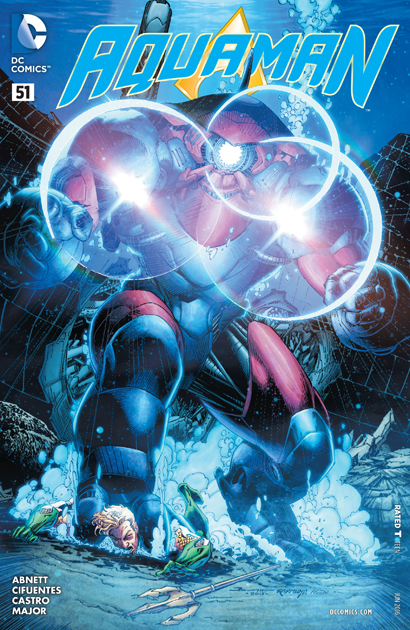 Spindrift Station, after just one issue, has turned into Aquaman's base of operations, akin to the Daily Planet or the roof of the GCPD, and that's a good thing. I have always thought to make Aquaman work as an ongoing headliner, he needed some of the more traditional trappings that some of his other, more regularly successful JLA pals had. SS is a good place to bring in the supporting characters, set up that issue's plot, etc. I hope it sticks around. 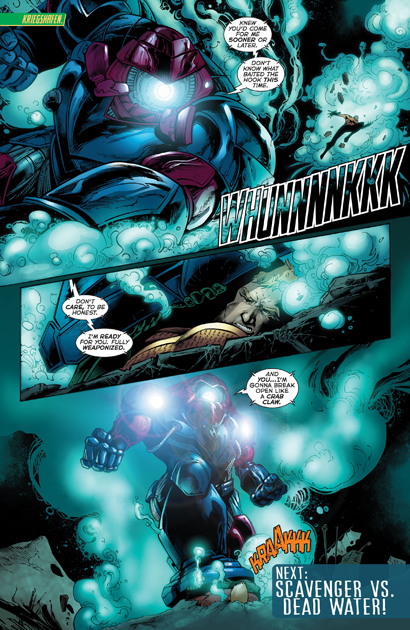 On an unrelated note, why can't Aquaman's trident be consistent? Most artists draw it with 5 tips and then some draw it looking completely different with with 3 tips(as shown in the last two issues). Even the trident in Rebirth looks completely different. Is he supposed to have a variety of tridents or is just a lack of artistic consistency? I really liked this issue. It had a lot of meat in it and it took me longer than 3 minutes to read the entire issue. I thought the art was great and I liked that the Scavenger returned. My favorite moment in this issue was when John Payne was in an isolated dry holding chamber and I think it was his sweat that got him enough water to burst out of his cell! I think the writer for this is doing a great job!